Update: A subtle bug has been found in the version 1.1.0. It is fixed now and new version 1.1.1 is available. The http://labelwriter.com/software/dls/sdk/js/DYMO.Label.Framework.latest.js has been updated to version 1.1.1 as well. Documentation for .NET classes is coming soon. Label layout information is stored using xml, so it is simple to operate it in the browser. The sample uses the jQuery library to load xml from the server though any other library can be used to do that. On the server the label is stored as a regular file “Address.label”. After label xml is downloaded from the server it is “opened” and stored in label variable by calling dymo.label.framework.openLabelXml() function. After the label is loaded its preview is generated by calling render() method. render() method returns preview data as a base64-encoded png stream, so it can be used as a data url for <img>. Please note that not all browsers support data urls, e.g. IE6 and IE7 do not support them at all, IE8 has a limitation of 32 Kb for an url, so not all labels can fit into this limit. But it is always possible to generate preview on the server if needed. To initialize TextArea element with address information from the label the getAddressText() method can be used. Because we know/assume that our label has only one address object on it we address it as an object with index ‘0’. To update the label with a new address entered in TextArea element. setAddressText() can be used. 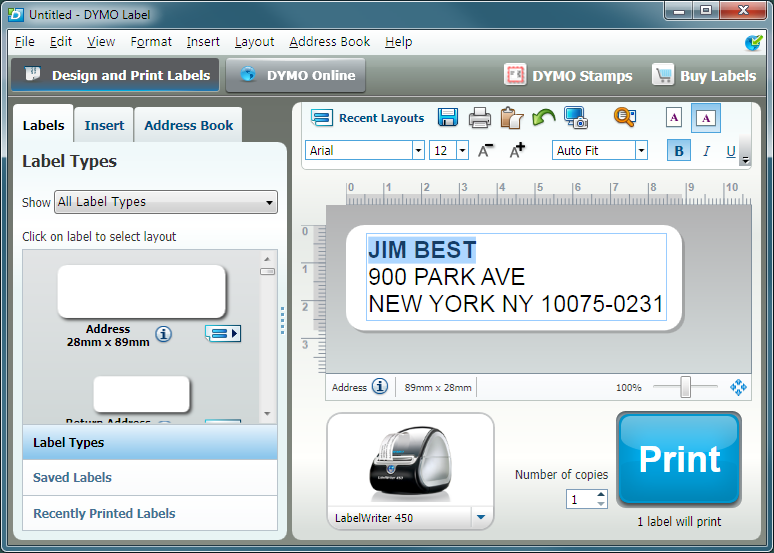 Printing is as simple as calling the print() method with the printer name selected from printers combo box. In this post we looked at how label previewing can be added into your web application. In the next post we will see how multiple labels can be printed.